McKee’s 37 Marine & RV Hydro Pearl Sio2 Coating is the ideal way to coat your RV or boat with glossy protection that lasts month after month. This innovative formula features the ultra-easy spray-on, rinse-off simplicity you need when coating a large RV or boat. 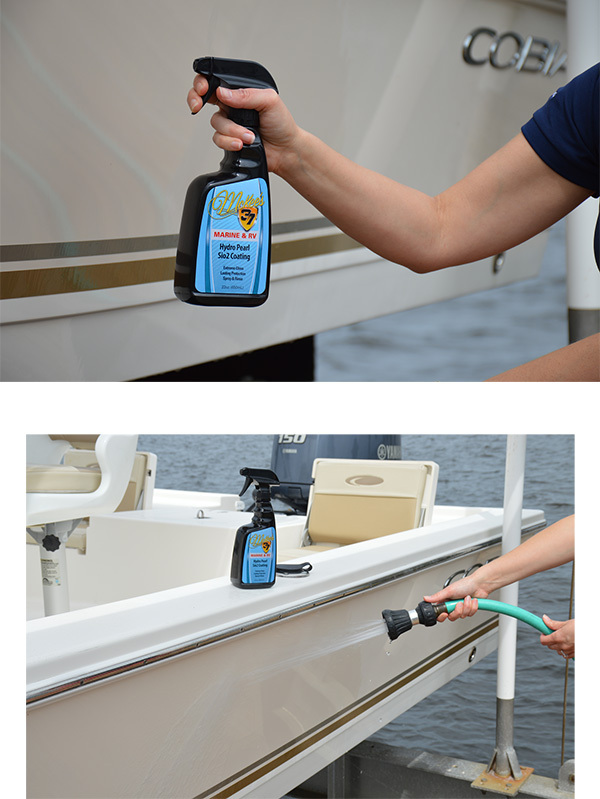 McKee’s 37 Marine & RV Hydro Pearl Sio2 Coating simplifies your maintenance routine without compromising on the level of protection, gloss, or water beading you’ll achieve! Scott Harry Cedar Rapids, IA. RV Hydro Pearl Sio2 on my 5th wheel 5 I washed my 39 5th wheel last week. I was in no mood to hand apply sealant after an 8-hour washing. After some research and a chat with Nick at McKees I ordered a bottle of McKees 37 Marine & RV Hydro Pearl Sio2 Coating. My wife and I rinsed down the 5th wheel one 8 section at a time, sprayed on the Hydro pearl and re-rinsed the area. The entire 5th wheel took us about 35-40 minutes. We used a leaf blower to dry it off and could see no spotting. Even on the windows we spot free. It happened to rain last night, and I didnt see any spotting this morning either. The water runs off as well as any hand applied polish ever has and the shine is as good too. I cant speak to the durability but if this holds up Ill never apply anything else. The product worked great and was simple to apply. It saved me 4 to 5 hours of hand work. Nick told me to use 8 sweeping pumps per section. This was the most difficult part. I just felt like I had to apply more product. Ive used mutli-coat, high end polishes on my cars for years. After applying this to my RV Im going to order up some McKees Hydro Blue Sio2 and see how it works on my truck. Will have to see how it hold up.